ONE CALL NOW - make sure the school office has your numbers so you'll be notified when announcements are made. Lose that piece of paper?? Click HERE to print out another one. Please get it into the office as soon as possible!! Make sure we get your phone numbers and email to add to our ONE CALL NOW Alert system and you will receive a text on your phone, a message on your voice mail, or an email. There will be an ALERT BANNER on the first page you click on, on the this website. Watch TV - WBNG will have it listed on the bottom of their screen and on their website. WHEN A DELAY IS ANNOUNCED, PLEASE KEEP WATCHING AS THE STATUS CAN GO FROM DELAYED TO CLOSED VERY QUICKLY. FOLLOW YOUR OWN SCHOOL DISTRICT - Since CBCA has students in many different school districts, follow the one you're in. For example, if your school district is closed, but CBCA is not, then YOUR CHILD IS NOT REQUIRED TO ATTEND. The same is true for delays. If your district is delayed 2 hours and for some reason CBCA is only delayed one hour, your student may come in after the 2 hour delay. K4 PROCEDURES - If CBCA is delayed for one hour, K4 will have class after the one hour delay. If CBCA is delayed for 2 hours, K4 WILL NOT HAVE CLASS THAT DAY. 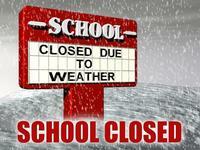 Closings apply to all classes and grades. EARLY DISMISSAL - When CBCA has to close early, a notice will be sent on the ONE CALL NOW Alert system alerting you to this decision. It will also posted on Facebook and on our Website. Studnet drivers will be dismissed when the decision is made to dismiss early. When CBCA is cancelled that also means that ALL AFTER SCHOOL ACTIVITIES ARE CANCELLED. When CBCA is delayed, it may or may not mean that the after school activities are cancelled. Stay tuned to Facebook/InstaTeam and the website to find out if there is practice/games that day. When a GAME needs to be rescheduled, all parents/players will be notified and it will be posted on Facebook/InstaTeam AND the new day/times will be posted on the SPORTS PAGE of this website.